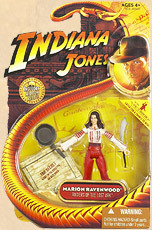 Are the Hasbro Indian Jones Figures Collectible? 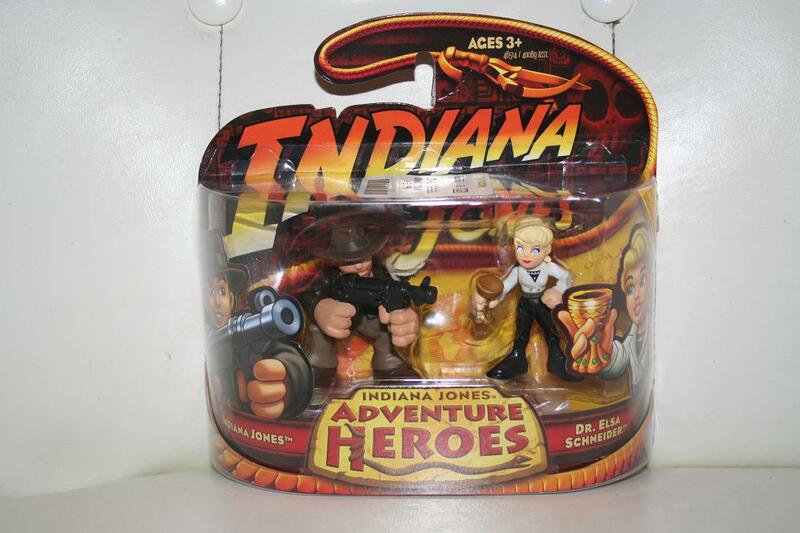 How Collectible Are The Hasbro Indiana Jones Action Figures? 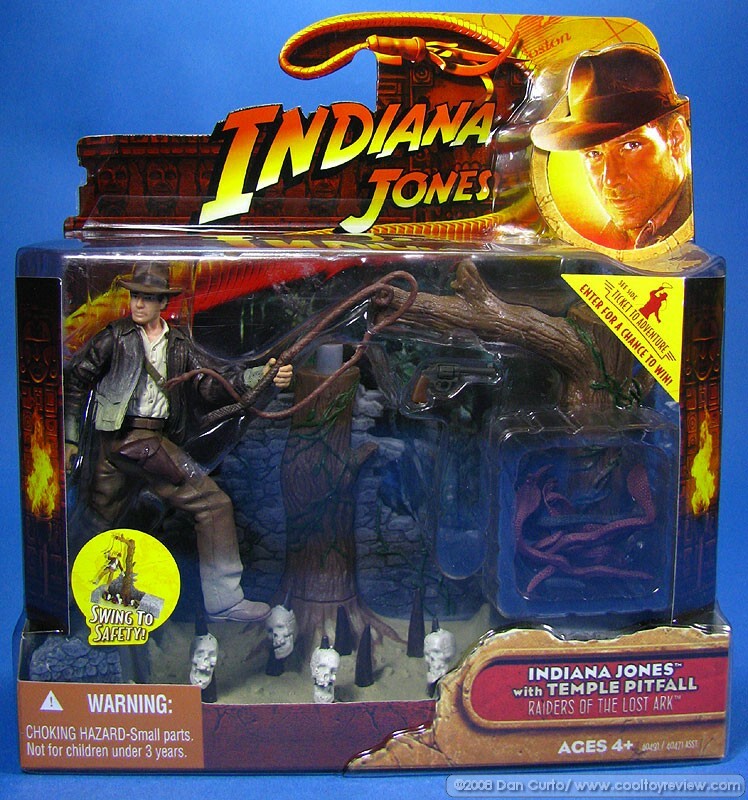 The Hasbro Indiana Jones figures were released in 1987 to coincide with the fourth movie in the franchise, The Kingdom of the Crystal Skull. 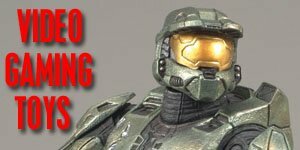 Its a well known fact that Hasbro are the largest toy company in the world and as a result of this most of their toys are mass produced and often over produced in order to make sure the can meet demand. However, couple this with the fact that some lines, such as this one, fail to capture the kids imaginations and sell shops are left with toy aisles full of stock that they can't sell and are eventually dumped, as was the case with most of these. 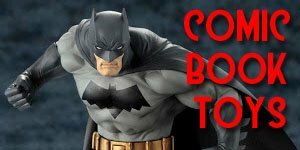 These figures generally sell for between $5-10, with the 12-inch figures fetching up to $20-25, and it seems very unlikely that they will gain much more than this in the coming years. 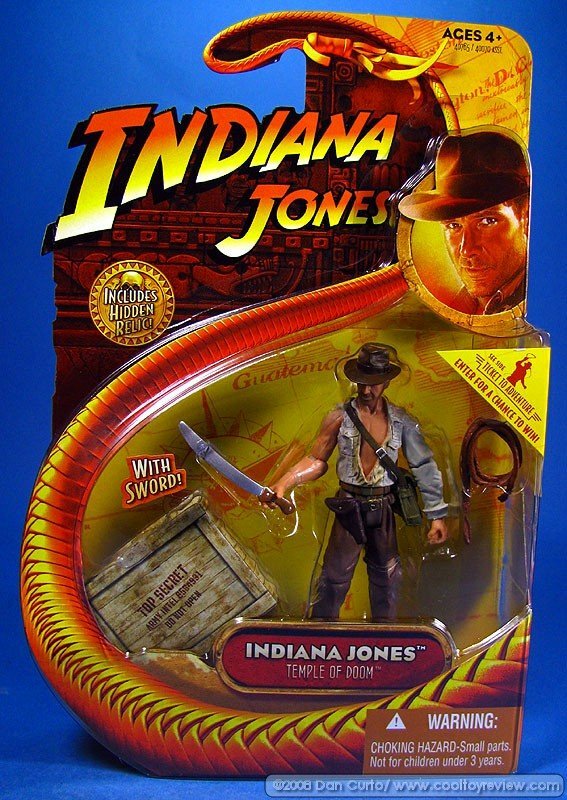 That said they are generally well made and sculpted figures and would make a great addition to any Indiana Jones collection, just don't expect to retires on any proceeds from them! 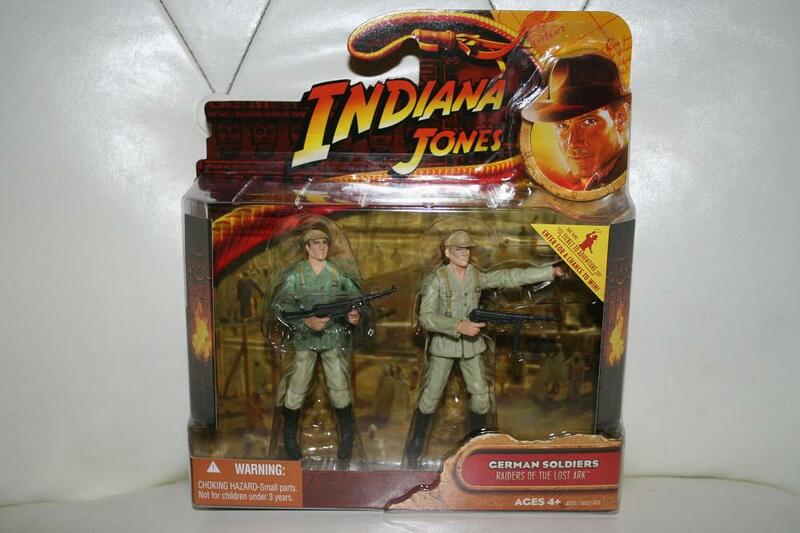 In mid-1991 Kenner was bought by Hasbro and in 2000 all the Kenner product lines were merged into Hasbro's. 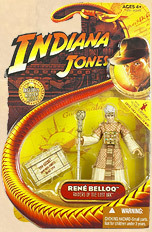 However it was not until the new Indiana Jones movie was released in 2007 that any new Indiana Jones figures were released. 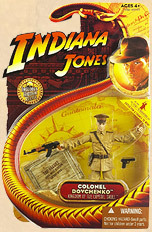 The first wave of the Hasbro’s Indiana Jones Figures consisted of basic figures, deluxe figures and vehicles. 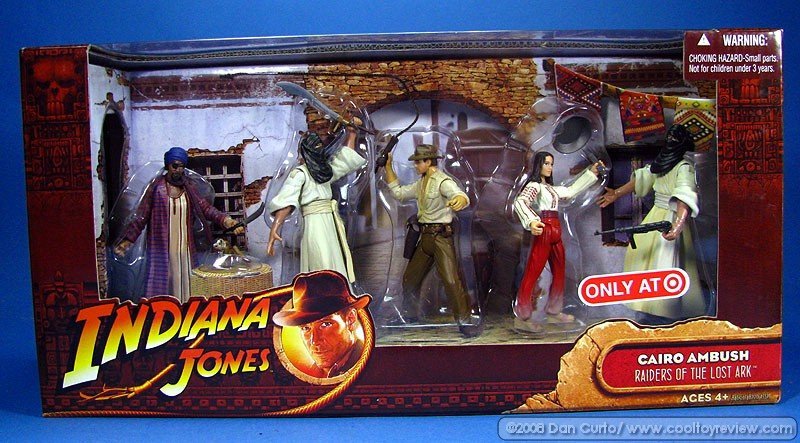 There were 5 basic 3 ¾ inch figures included 2 different Indiana Jones figures, one with a leather jacket and one without, Marion Ravenwood, Sallah, Belloq, Cairo Swordsman, Monkey Man and a German Soldier. 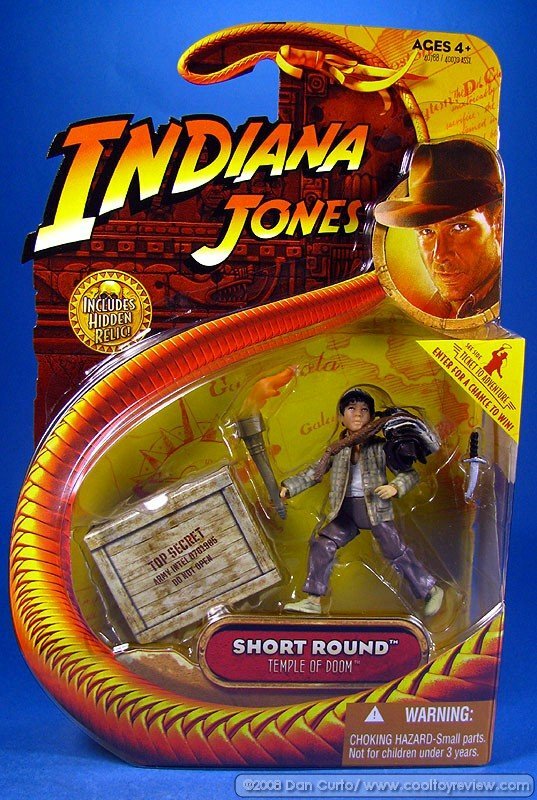 The 7-inch deluxe figures included another 4 variant Indiana Jones figures most, of them with only a very slight variance, e.g. one has gloves, another has a slightly darker tunic etc. 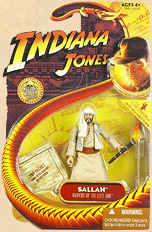 The only major variant from the basic figures was the Indiana Jones with Ark figure which came with Indy wearing Arabian robes and a turban. 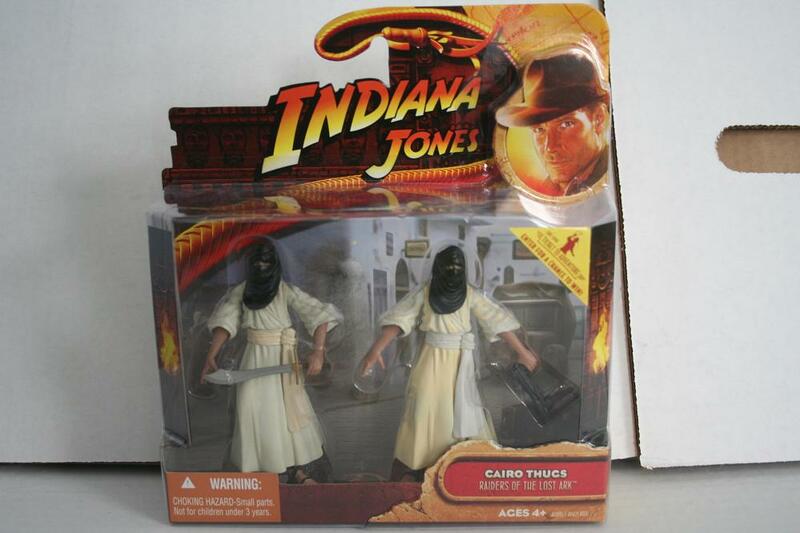 The Marion Ravenwood and German Soldier Deluxe packs came with two figures. The Marion pack also included a Cairo Henchman. 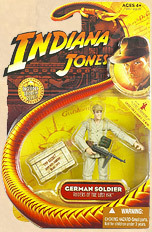 Hasbro used the same mould for both the German Soldiers but with different colored tunics, one khaki and one olive green. One also had fair hair while the other one had dark hair and they had different eyes. 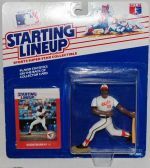 These figures came with multiple points of articulation, ranging from 8 to 14, and were packaged with various accessories. 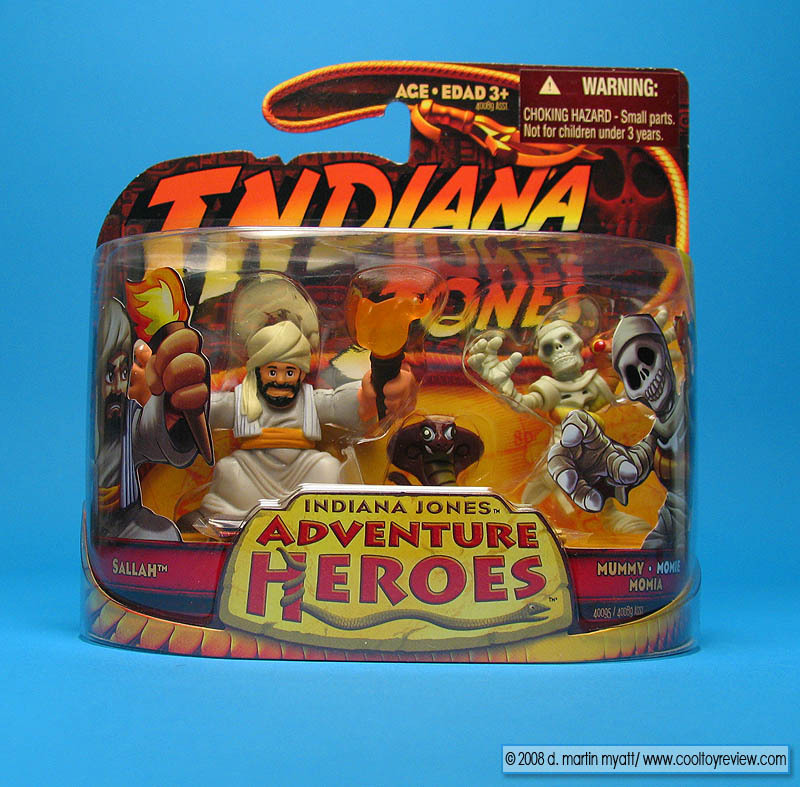 The accessories with these figures were bigger and better than the basic figures, such as a horse for Indy, a motorbike, machine guns etc. 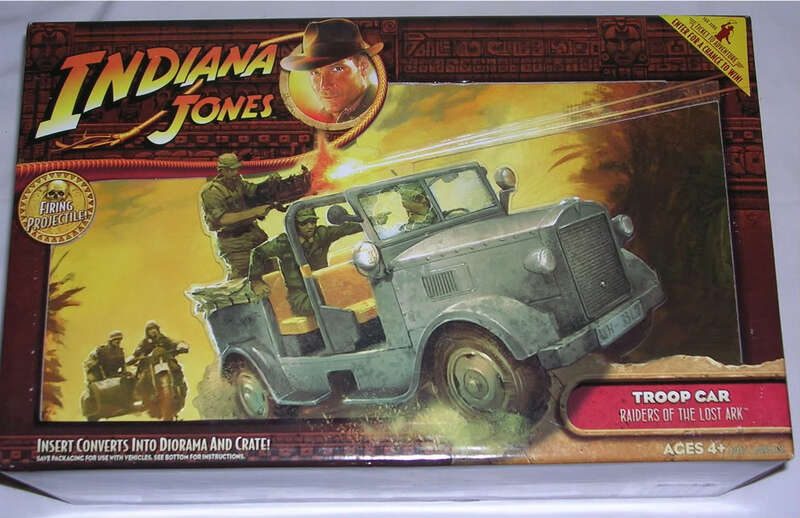 The wave 1 vehicles consisted of a Cargo Truck and a Troop Car. The cargo truck had a whip dragging action that had and the troop car came with a gun firing projectile and some barrels and a barricade. 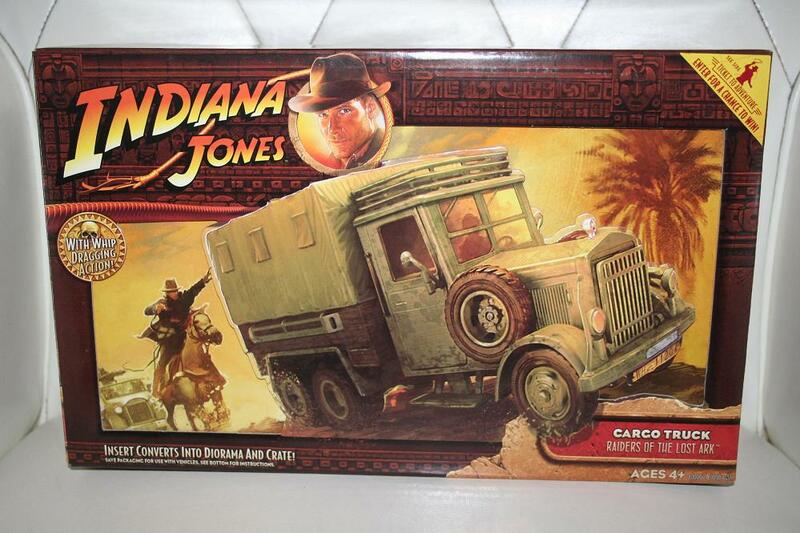 The packaging on both these vehicles also doubled up as dioramas. 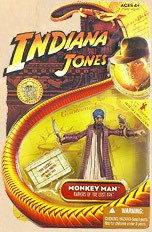 Indiana Jones with Ark: 14 points of articulation: neck, 2 shoulders, 2 arms, 2 hands, torso, 2 knees, 2 feet, and 2 hips. 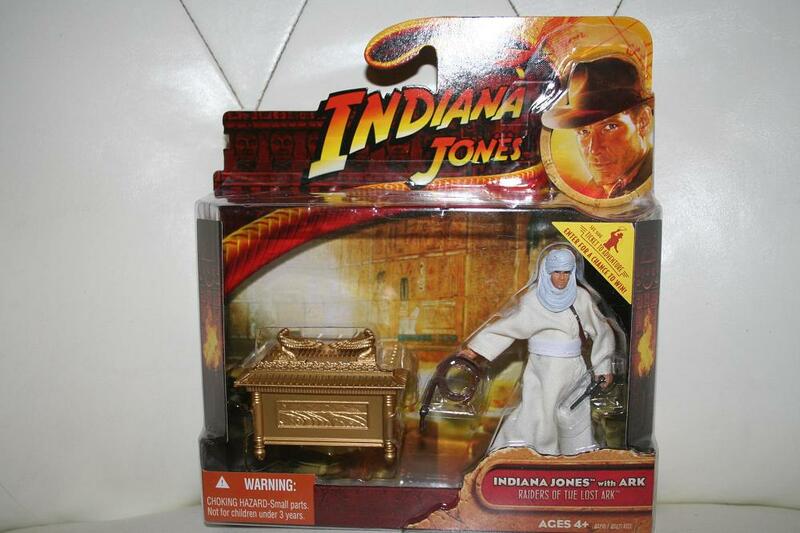 Accessories: the ark of the covenant, whip, shoulder bag and revolver. 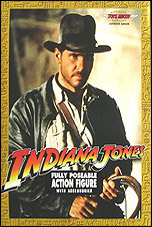 Indiana Jones with Horse: 14 points of articulation: neck, 2 shoulders, 2 arms, 2 hands, torso, 2 knees, 2 feet, and 2 hips. 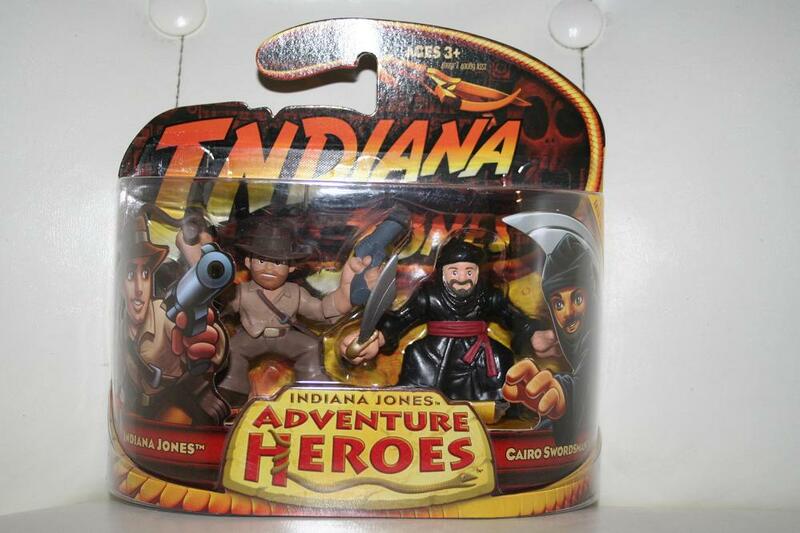 Accessories: a horse, whip and revolver. 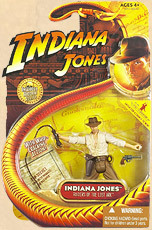 Indiana Jones with Temple Trap: 10 points of articulation: neck, 2 shoulders, 2 arms, 2 hands, torso, and 2 hips. Accessories: a temple trap set, revolver, whip, sand bag and golden idol. 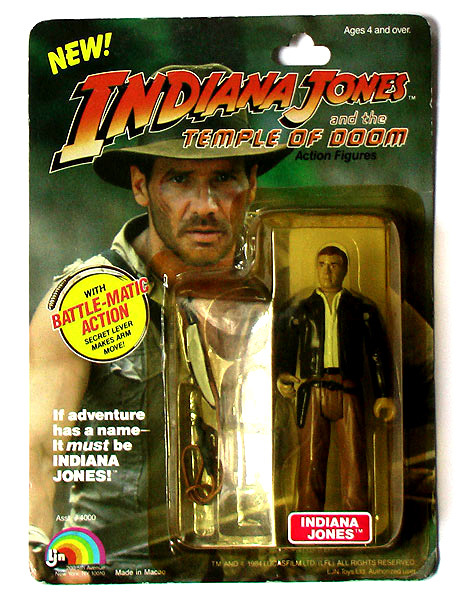 Indiana Jones with Temple Pitfall: 10 points of articulation: neck, 2 shoulders, 2 arms, 2 hands, torso, and 2 hips. Accessories: a temple pitfall set, 8 snakes, revolver, and whip. 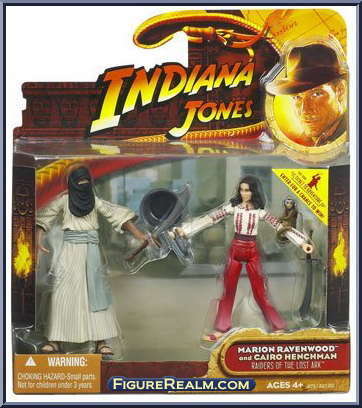 Marion Ravenwood and Cairo Henchman: Marion with 12 points of articulation: neck, 2 shoulders, 2 arms, 2 hands, torso, 2 feet, and 2 hips. 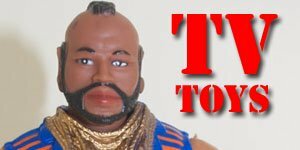 Henchman with 10 points of articulation: neck, 2 shoulders, 2 arms, torso, 2 knees, and 2 hips. Accessories: a monkey, frying pan and two swords (not identical). German Soldiers: 14 points of articulation: neck, 2 shoulders, 2 arms, 2 hands, torso, 2 knees, 2 feet, and 2 hips. Accessories: two machine guns (not identical). 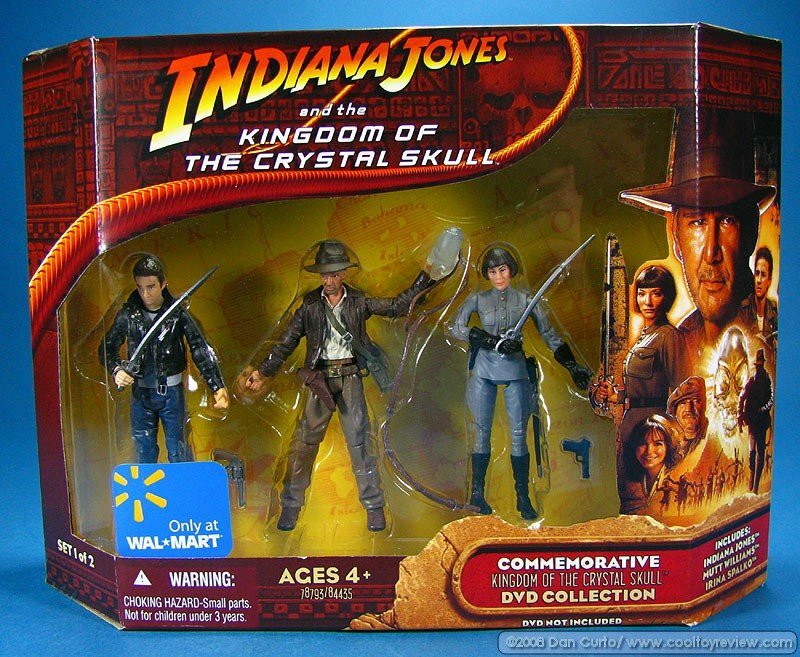 Wave two of their Indiana Jones figures was based on the fourth movie in the series, The Kingdom of the Crystal Skull. 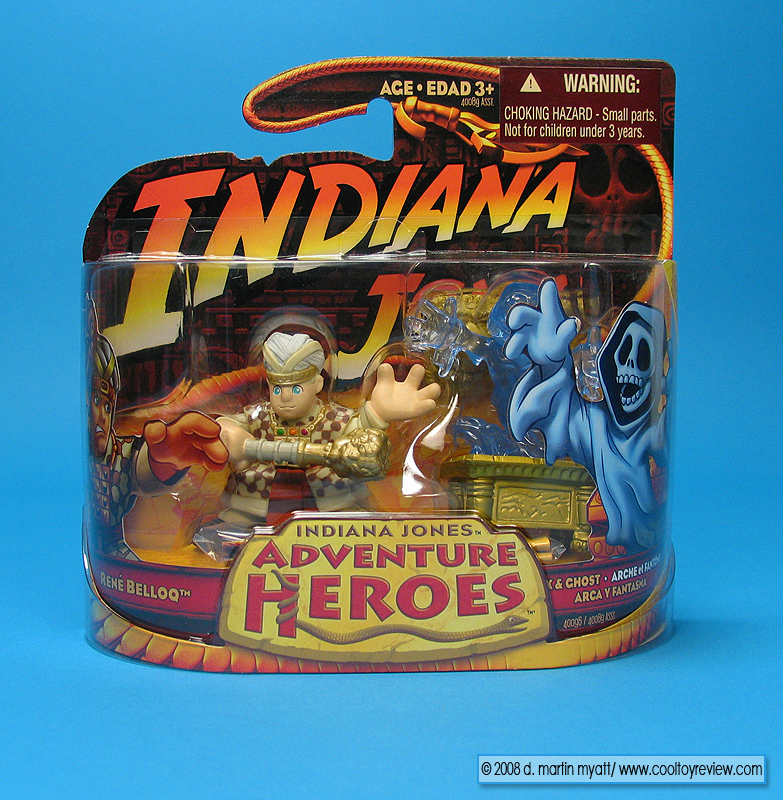 This set was generally well received by collectors as the quality and sculpting was far superior to the first wave. 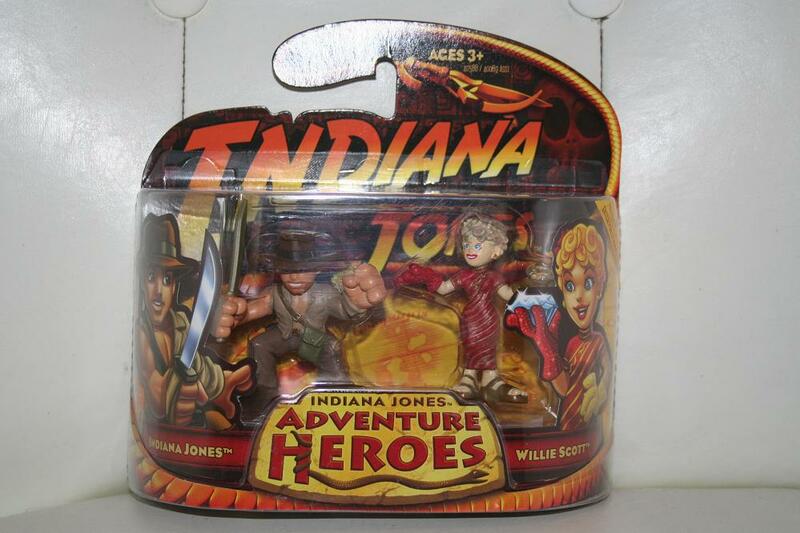 Wave two of consisted of 9 figures that included 2 variations of Indiana Jones and two versions of Mutt Williams. 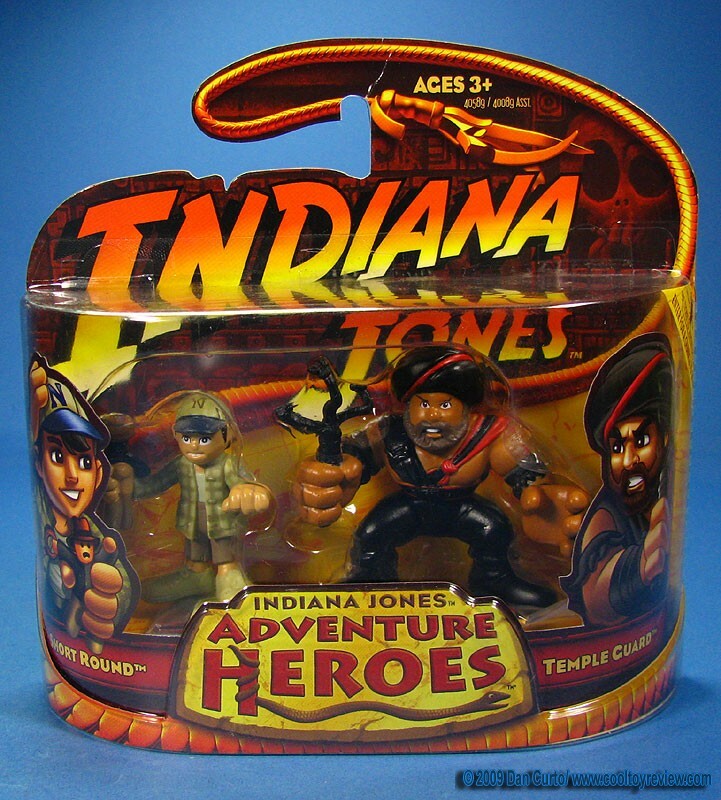 Each of the figures in this series had 14 points of articulation, except one of the Indiana Jones figures which only had 12, and the packaging included a hidden relic with each figure and a variety of accessories. Unlike wave 1 though there were no Deluxe figures in this wave and only one play-set, but it was an excellent play set that no doubtfully gave many kids hours of fun!. 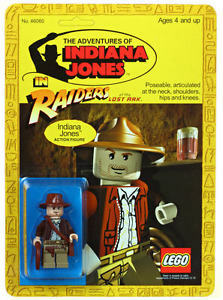 Indiana Jones: 14 points of articulation: neck, 2 shoulders, 2 arms, 2 hands, torso, 2 knees, 2 feet, and 2 hips.Accessories: a revolver, whip, fedora, shoulder bag, extra hand and crystal skull. 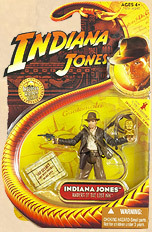 Indiana Jones: 12 points of articulation: neck, 2 shoulders, 2 arms, torso, 2 knees, 2 feet, and 2 hips. Accessories: a whip, shoulder bag and RPG. 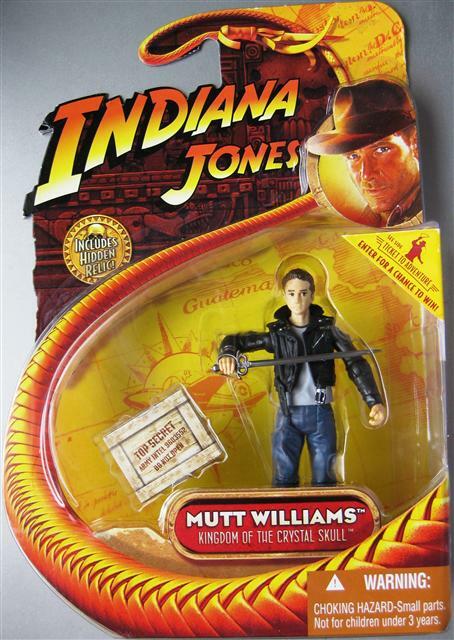 Mutt Williams: 14 points of articulation: neck, 2 shoulders, 2 arms, 2 hands, torso, 2 knees, 2 feet, and 2 hips. Accessories: a switch knife and anaconda. 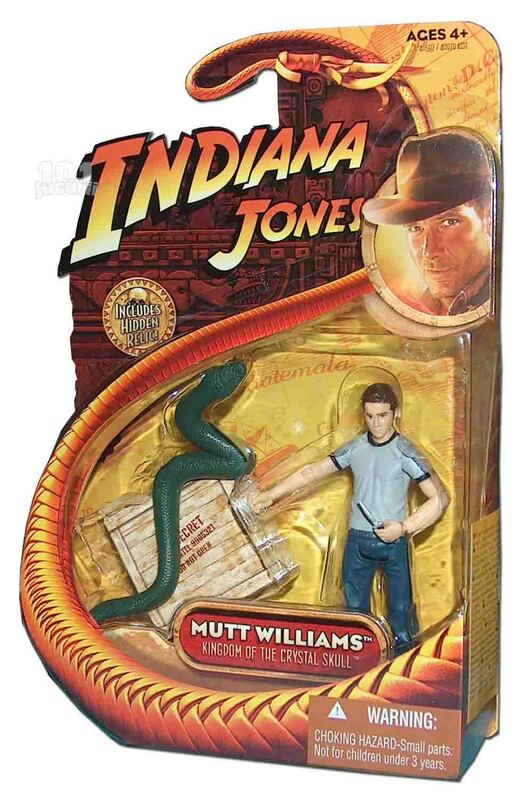 Mutt Williams : 14 points of articulation: neck, 2 shoulders, 2 arms, 2 hands, torso, 2 knees, 2 feet, and 2 hips. Accessories: a sword. 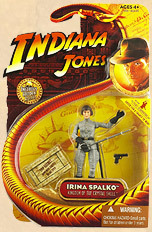 Irina Spalko: 14 points of articulation: neck, 2 shoulders, 2 arms, 2 hands, torso, 2 knees, 2 feet, and 2 hips. Accessories: a pistol and sword. Colonel Dovchenko: 14 points of articulation: neck, 2 shoulders, 2 arms, 2 hands, torso, 2 knees, 2 feet, and 2 hips. 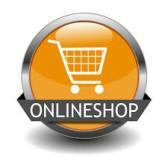 Accessories: a pistol and machine gun (AK-47). Russian Soldier: 14 points of articulation: neck, 2 shoulders, 2 arms, 2 hands, torso, 2 knees, 2 feet, and 2 hips. Accessories: a machine gun (AK-47). Cemetery Warrior: 14 points of articulation: neck, 2 shoulders, 2 arms, 2 hands, torso, 2 knees, 2 feet, and 2 hips. Accessories: a blowpipe and shoulder bag. Colonel Vogel- Accessories: Luger Pistol, Walking Stick, Top Secret Crate #8802155, Axe of Leif Erikson. 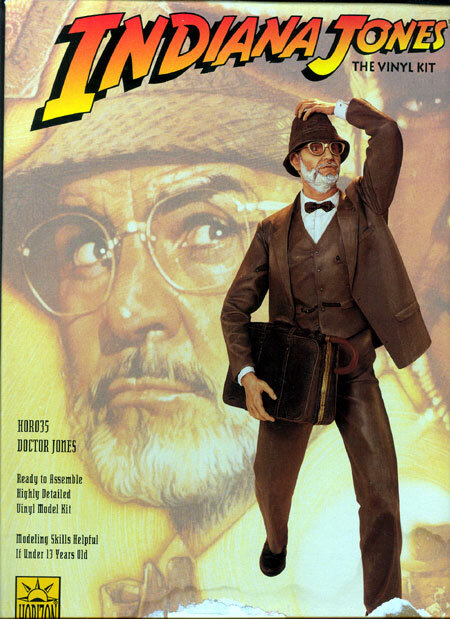 Dr. Henry Jones- Accessories: Hat, Glasses, Grail Diary, Briefcase, Umbrella, Luger Pistol, Top Secret Crate, #1103711, Holy Grail Relic. Grail Knight- Accessories: Sword, Cape, Holy Grail, Top Secret Crate #2003658, Sir Richard's Shield. 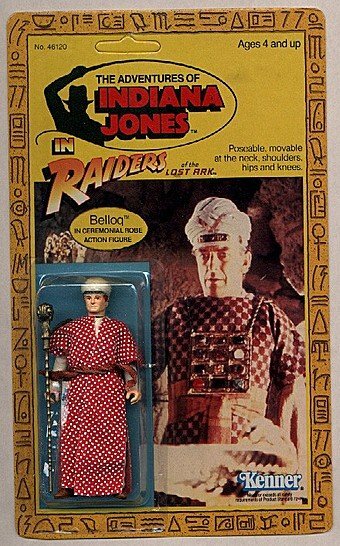 Indiana Jones (Sub-Machine Gun)- Accessories: Sub-Machine Gun, Bullwhip (Coiled), Satchel, Top Secret Crate #9632159, Thugee Medallion. 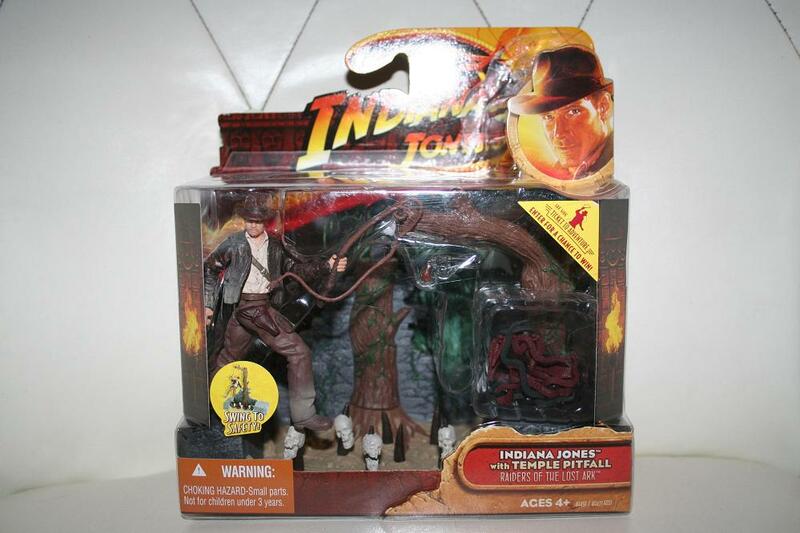 Young Indy- Accessories: bullwhip, Snake, Top Secret Crate #7823621, Cross of Coronado. 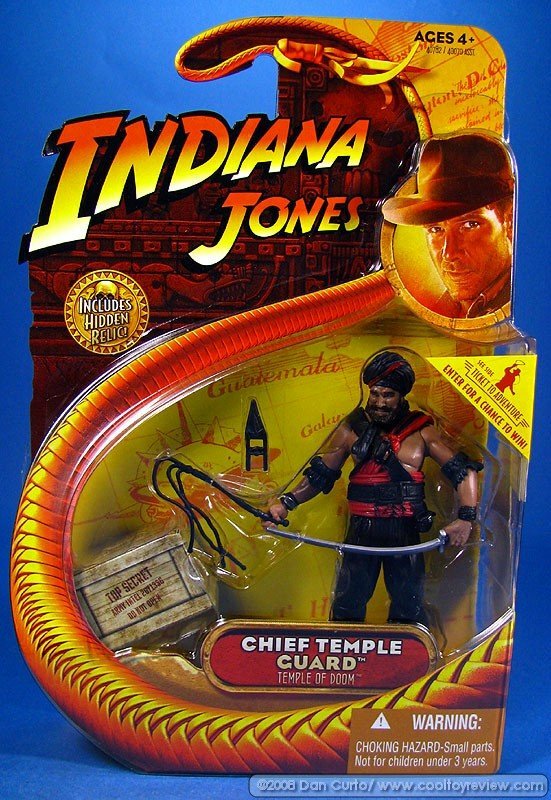 Chief Temple Guard- Accessories: Sword, Katar, Whip, Scarf, Top Secret Crate #2671336, Spartan Helmet. 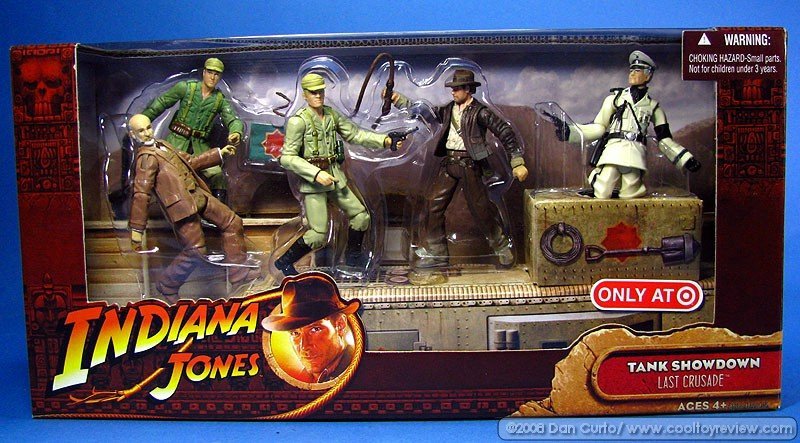 Indiana Jones (Sankara Stones)- Accessories: Machete, Satchel with Sankara Stones, Bullwhip (Coiled), Top Secret Crate #6564931, Easter Island Statue. 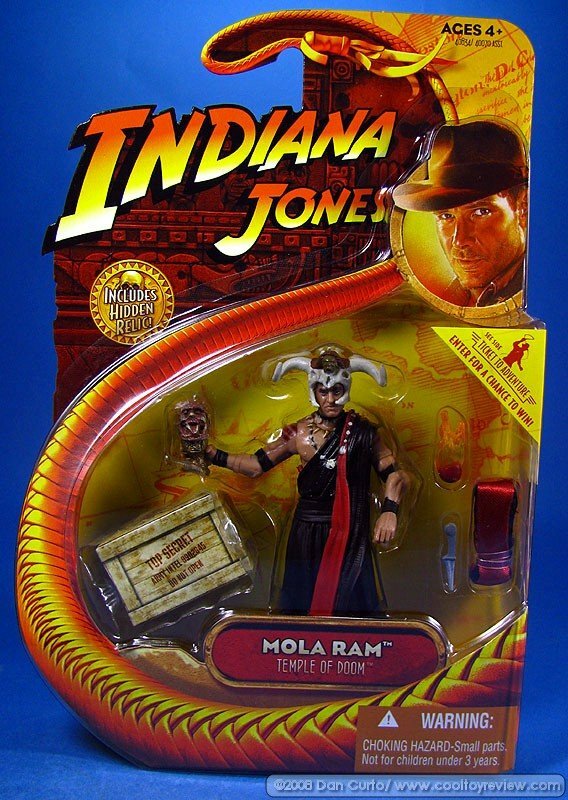 Mola Ram- Accessories: Ceremonial Headdress, Dagger, Flaming Heart, Cloth Sash, Chalice of Kali, Top Secret Crate #9902645, Chinese Lion. 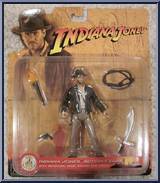 Short Round- Accessories: Torch, Dagger, Indy's Gear, Top Secret Crate #0761985, Anubis Statue. 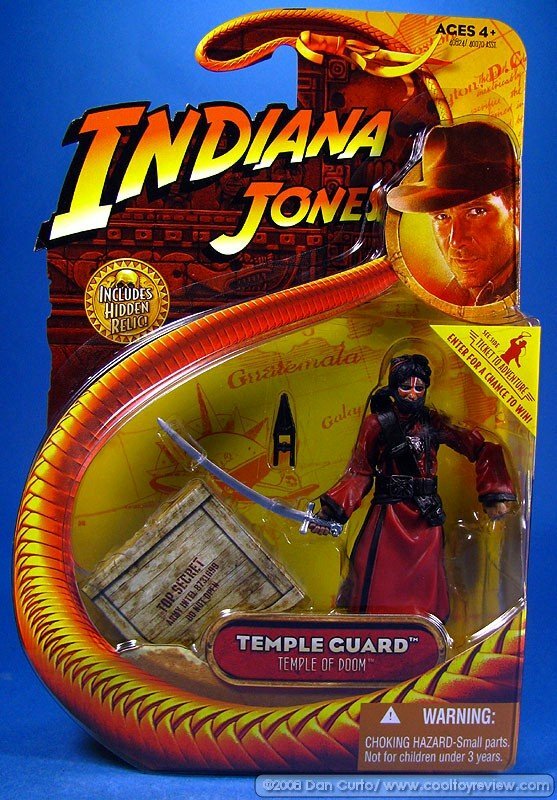 Temple Guard- Accessories: Sword, Katar, Scarf, Top Secret Crate #8731699, Sun Dial. 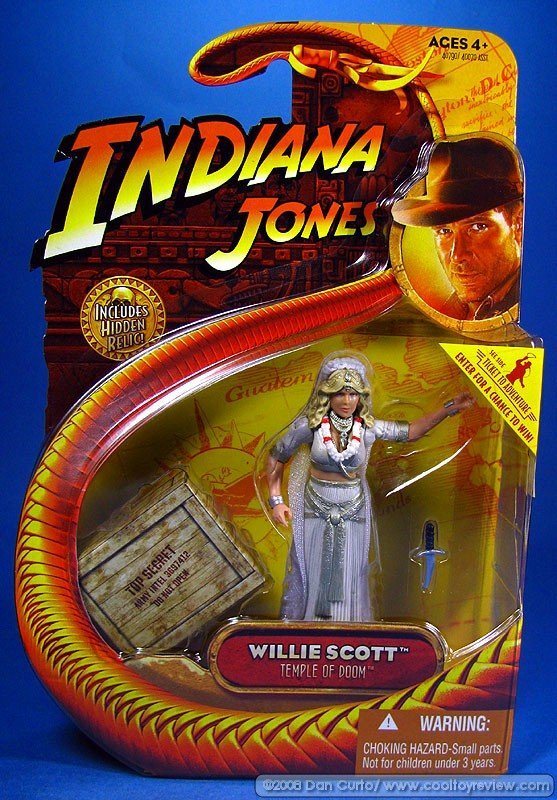 Willie Scott- Accessories: Dagger, Necklace, Lei, Top Secret Crate #3697412, Philospher's Stone. 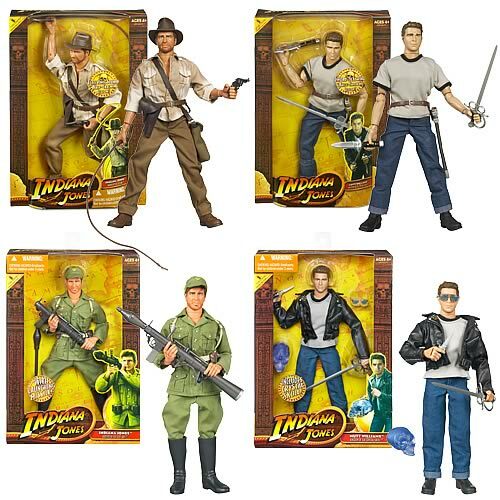 Cairo Ambush Battle Pack – This set is exclusive to Target stores. 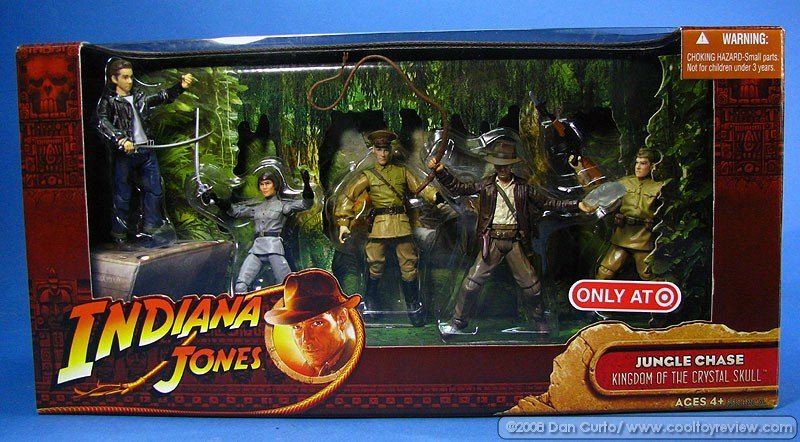 Jungle Chase Battle Pack - This set is exclusive to Target stores. Tank Showdown Battle Pack – This set is exclusive to Target stores. 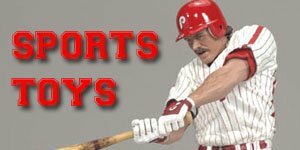 DVD Commemorative Set 1 – This set is exclusive to Wal-Mart stores. DVD Commemorative Set 2 - This set is exclusive to Wal-Mart stores. 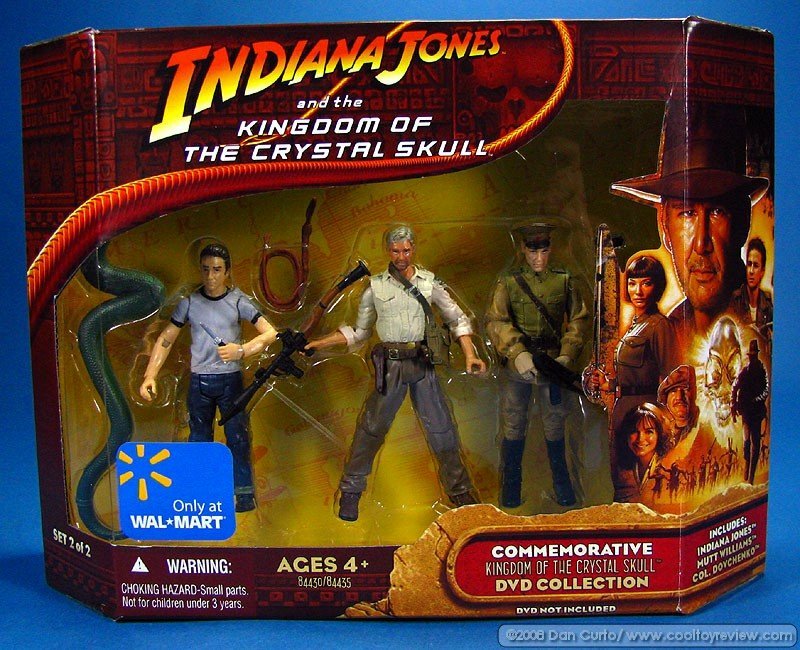 Released in 2008 several weeks prior to The Kingdom of the Crystal Skull these double packs featured stylized cartoonish looking 3.5 inch figures with Series 1 and 2 being released simultaneously but the packs were fairly large and bulky taking up excessive peg space in retailers, a problem which was compounded by its extremely poor sales. As a result many of the figures were quickly dumped to make way for more profitable and faster moving lines. 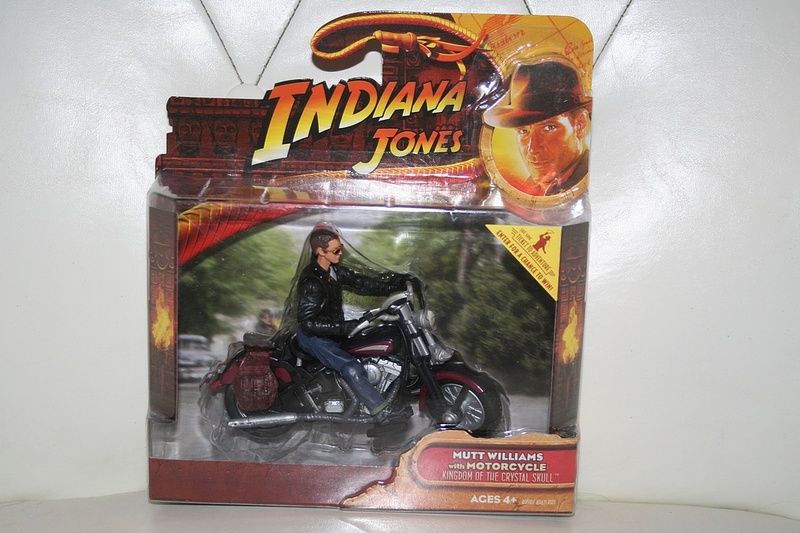 As a result when series 3 and 4 were released there was very little uptake from retailers and those that did stock them didn’t replenish their stocks once they had sold which meant that these are a lot harder to find than the initial figures. A series 5 was slated to be released and was listed on Walmarts order sheets but it never materialized and was eventually cancelled. 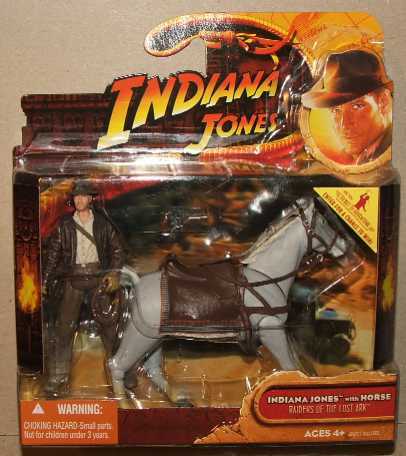 A mail away Indiana Jones and Horse was also produced. 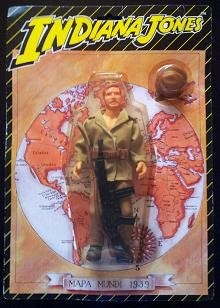 In order to receive this figure you had to collect six stickers and send them with the map that came in each pack, along with the p+p fee to Hasbro. This promotion only lasted until the end of 2008 and although all the packs in series 1 and 2 came with a sticker they were more random in series 3 and 4, therefore it seems unlikely that there are many of these (proportionately) floating around. 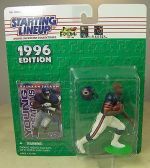 You can pick these figures up mint in the packs for about $10 or loose for $2-$3 each and the mail in Indy and Horse goes for about $10 on eBay, however please note these prices are likely to vary depending on how many are listed at the time and the number of people bidding, the old supply and demand thing again!